My third wedding guest outfit for Wedding Week is… What to Wear to a Stylish Town Hall Wedding – my favourite type to dress for! Quite often town weddings are held in a swanky town hall, hotel or register office, so I think it gives you free reign to go uber-sophisticated. I love seeing wedding guests strolling through a city centre just before or after a wedding, if only really to see what they’re wearing. The brides I’ve seen in large cities like London and Bath most typically wear jackets, beaded dresses, sequins, etc., and the guests often have a cool, artistic or slightly retro feel to their outfits… I decided to go with that feel for this look. 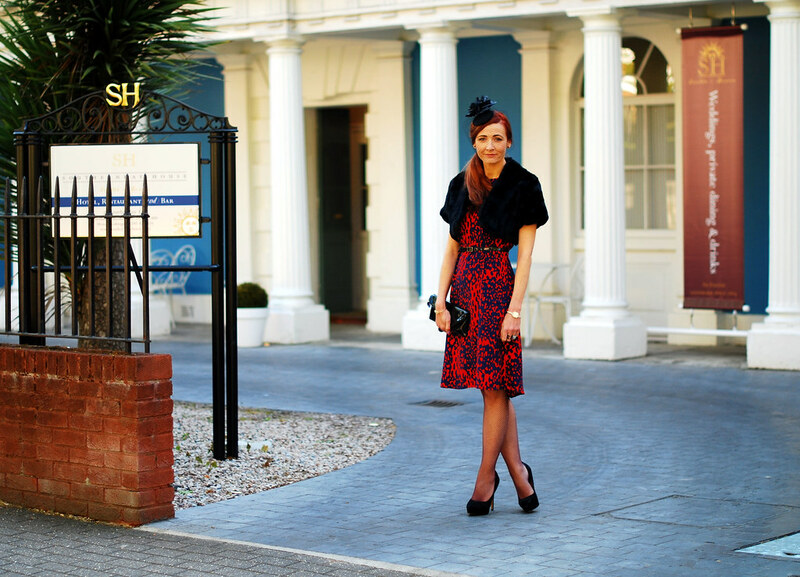 The animal print midi dress I wore in this post worked beautifully with the faux fur shrug; I love this 1940s inspired look! 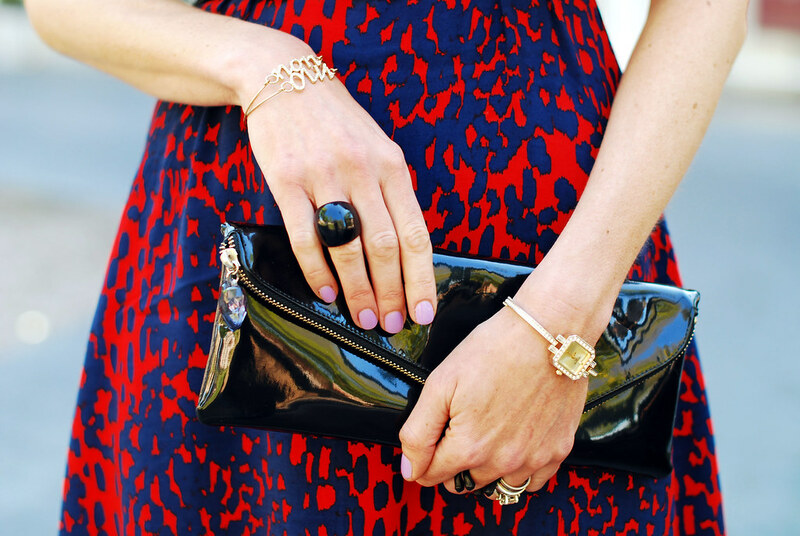 Think chic sophistication. A town wedding often involves being dressed up and walking through crowds of shoppers, so you’ll most probably be stared at – make it worth their while! 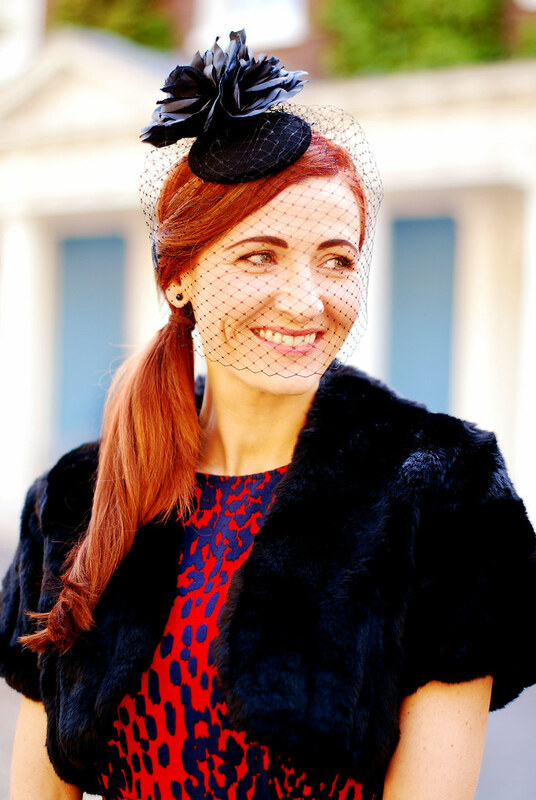 Consider a small pillbox hat or veiled fascinator rather than a huge hat – how about making your own like I did? Total cost of my fascinator: £6.69 (a total bargain)! Assembling it is easy – simply glue or stitch the hairclip to the underside of the base, then gather the veiling along one of the long edges with a running stitch through the holes. Arrange it on top of the base so that it covers your face at the length you’d like it to sit, then stitch into place. Cover the stitching with the flower pinned on top – that’s it! The hairclip will hold it in place to your hair, and a few kirby grips [bobby pins] are handy to keep the veiling down and in place as well. There’ll be two more posts for Wedding Week; on Sunday I’ll suggest What to Wear to a Wedding Evening Reception – forget having to dress for church, that calls for a party outfit! Got any great tips for outfits to wear to town weddings? How dressed up did you get for ones you’ve attended – let me know! You really have an outstanding fashion sense! You really look sophisticated in that lovely red printed dress. I really appreciate the tips you have posted coz’ I’m not really good in fashion. So, thanks a lot for that. Anyway, I just stopped to see what’s new. Have a happy and bubbly weekend! I actually am having a vintage-inspired wedding here in a few weeks, so this post is just especially lovely (well, I like all the wedding outfit posts, but this is my favorite!! I adore the fascinator especially and am impressed it was a DIY project! Lovely idea to go uber chic for a city wedding. You'll look wonderful dropping into a upscale bar for champagne afterward, too! This is stunning! What a fabulous dress and your hourglass figure is amazing!! Love the entire sophisticated look. This dress is gorgeous and I love the birdcage! 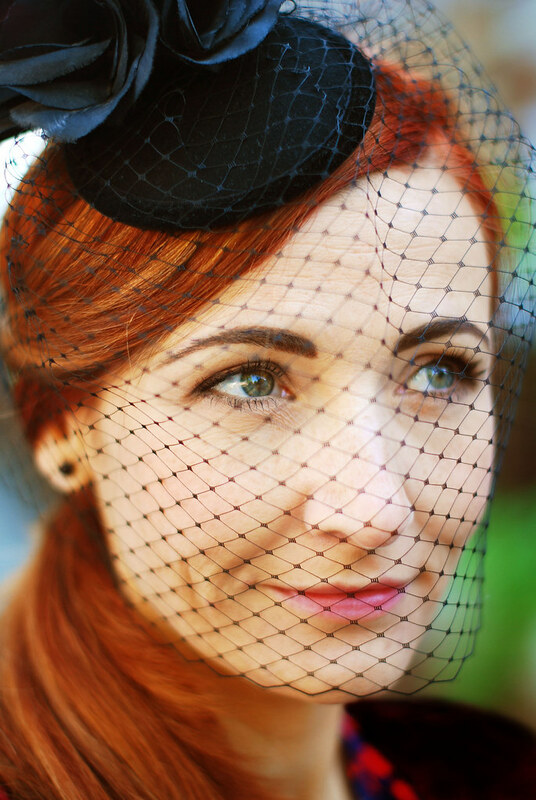 I am in love with your fascinator and as a fan of the full face veil – Brava! Brilliant! So sophisticated. This is my fave too. you are stunning! i LOVE that dress! such a great fit and design! I think this is my favorite so far this week!